Visit our pet boutique in Kennebunkport, Maine... Maine, aka "vacationland," is a wonderful travel destination and we look forward to seeing you. Dogs and cats love to shop at Scalawags. Scalawags is a one-of-a-kind pet boutique offering dog toys, dog treats, dog collars, harnesses, and leashes, dog clothes and accessories, dog and cat supplies, pet lover gifts and so much more. We are proud to offer many USA and New England made products as well as nautically-inspired items for your pet and your home. Visit ScalawagsOnline.com often to shop for new arrivals. Planning a trip to Maine? Check out our Kennebunkport pages for pet-friendly travel information with links to travel resources including pet-friendly hotels, beaches, and other pet-friendly resources. 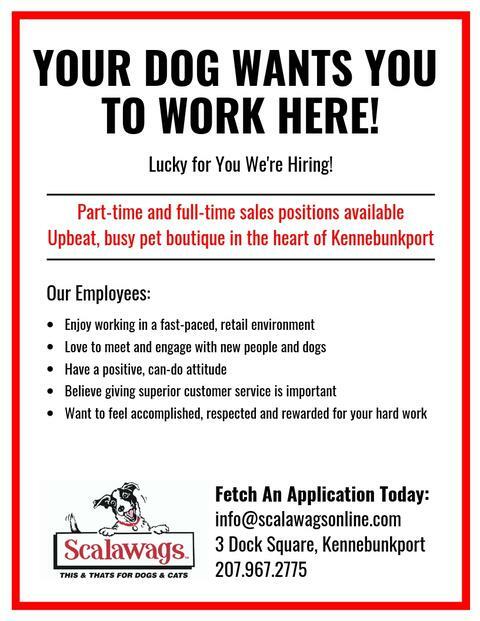 Be sure to stop by Scalawags in our new location at 3 Dock Square, Kennebunkport. We look forward to meeting you and your scalawags!